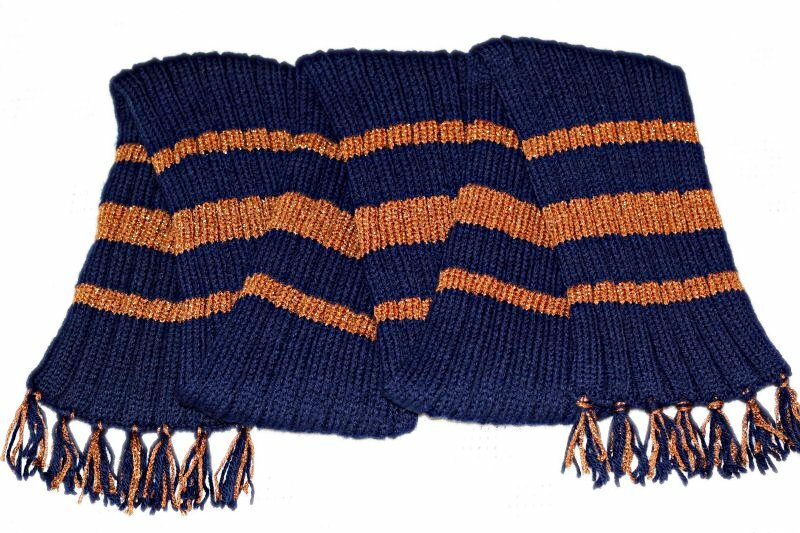 This was inspired by the scarves in the movie version of Harry Potter and The Prisoner of Azkaban, but with a different stripe pattern and i used the book colors for Ravenclaw rather than the movie ones. Also, if you thought the ones in the movie looked warm, this pattern is insane -- knit in the round and ribbed, it's about 4x as thick as single-ply stockinette. Cast on 84 stitches (i used a long-tail cast-on) using the navy yarn. Knit one row in the pattern: k5,p2,[k4,p2]x5,k10,p2,[k4,p2]x5,k5. join. (i tied knots. be sure to keep knots and tails on the inside of the tube). Repeat until desired length. My scarf was 6 reps total and was 6ft long. This pattern is copyright © 2008 Rob Starling. It is an original work and may be used for non-commercial purposes only. I'm happy to answer questions about the pattern -- find me on Ravelry (robstar) or email me at rob -at- robstarling -dot- org.